On some standard computer-vision tasks, short programs — less than 50 lines long — written in a probabilistic programming language are competitive with conventional systems with thousands of lines of code, MIT researchers have found. Most recent advances in artificial intelligence — such as mobile apps that convert speech to text — are the result of machine learning, in which computers are turned loose on huge data sets to look for patterns. To make machine-learning applications easier to build, computer scientists have begun developing so-called probabilistic programming languages, which let researchers mix and match machine-learning techniques that have worked well in other contexts. In 2013, the U.S. Defense Advanced Research Projects Agency launched a four-year program to fund probabilistic-programming research. By the standards of conventional computer programs, those “models” can seem absurdly vague. 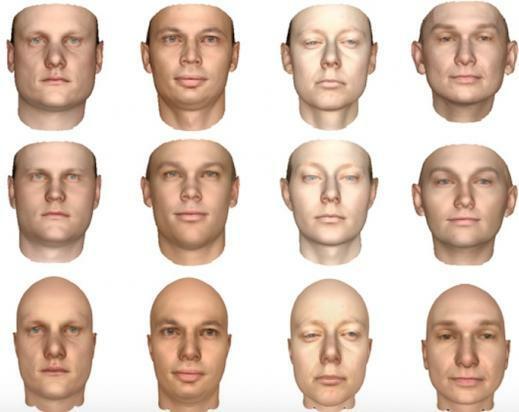 One of the tasks that the researchers investigate, for instance, is constructing a 3-D model of a human face from 2-D images. Their program describes the principal features of the face as being two symmetrically distributed objects (eyes) with two more centrally positioned objects beneath them (the nose and mouth). It requires a little work to translate that description into the syntax of the probabilistic programming language, but at that point, the model is complete. Feed the program enough examples of 2D images and their corresponding 3D models, and it will figure out the rest for itself. Joining Kulkarni on the paper are his adviser, professor of brain and cognitive sciences Josh Tenenbaum; Vikash Mansinghka, a research scientist in MIT’s Department of Brain and Cognitive Sciences; and Pushmeet Kohli of Microsoft Research Cambridge. For their experiments, they created a probabilistic programming language they call Picture, which is an extension of Julia, another language developed at MIT. The new work, Kulkarni says, revives an idea known as inverse graphics, which dates from the infancy of artificial-intelligence research. Even though their computers were painfully slow by today’s standards, the artificial intelligence pioneers saw that graphics programs would soon be able to synthesize realistic images by calculating the way in which light reflected off of virtual objects. This is, essentially, how Pixar makes movies. Some researchers, like the MIT graduate student Larry Roberts, argued that deducing objects’ three-dimensional shapes from visual information was simply the same problem in reverse. But a given color patch in a visual image can, in principle, be produced by light of any color, coming from any direction, reflecting off of a surface of the right color with the right orientation. Calculating the color value of the pixels in a single frame of “Toy Story” is a huge computation, but it’s deterministic: All the variables are known. Inferring shape, on the other hand, is probabilistic: It means canvassing lots of rival possibilities and selecting the one that seems most likely. That kind of inference is exactly what probabilistic programming languages are designed to do. Kulkarni and his colleagues considered four different problems in computer vision, each of which involves inferring the three-dimensional shape of an object from 2D information. On some tasks, their simple programs actually outperformed prior systems. The error rate of the program that estimated human poses, for example, was between 50 and 80 percent lower than that of its predecessors. In a probabilistic programming language, the heavy lifting is done by the inference algorithm — the algorithm that continuously readjusts probabilities on the basis of new pieces of training data. In that respect, Kulkarni and his colleagues had the advantage of decades of machine-learning research. Built into Picture are several different inference algorithms that have fared well on computer-vision tasks. Time permitting, it can try all of them out on any given problem, to see which works best. The researchers will present the system at the Computer Vision and Pattern Recognition conference in June. Recent progress on probabilistic modeling and statistical learning, coupled with the availability of large training datasets, has led to remarkable progress in computer vision. Generative probabilistic models, or “analysis-by-synthesis” approaches, can capture rich scene structure but have been less widely applied than their discriminative counterparts, as they often require considerable problem-specific engineering in modeling and inference, and inference is typically seen as requiring slow, hypothesize-and-test Monte Carlo methods. Here we present Picture, a probabilistic programming language for scene understanding that allows researchers to express complex generative vision models, while automatically solving them using fast general-purpose inference machinery. Picture provides a stochastic scene language that can express generative models for arbitrary 2D/3D scenes, as well as a hierarchy of representation layers for comparing scene hypotheses with observed images by matching not simply pixels, but also more abstract features (e.g., contours, deep neural network activations). Inference can flexibly integrate advanced Monte Carlo strategies with fast bottom-up datadriven methods. Thus both representations and inference strategies can build directly on progress in discriminatively trained systems to make generative vision more robust and efficient. 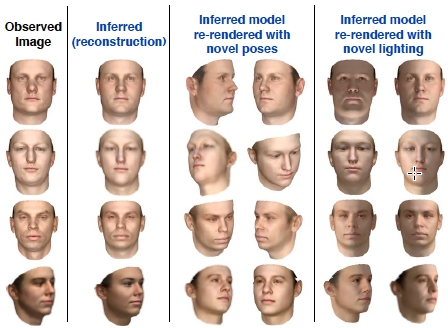 We use Picture to write programs for generative 3D face analysis, 3D human pose estimation, and 3D object reconstruction – each in under 50 lines of code, and each competitive with specially engineered baselines.